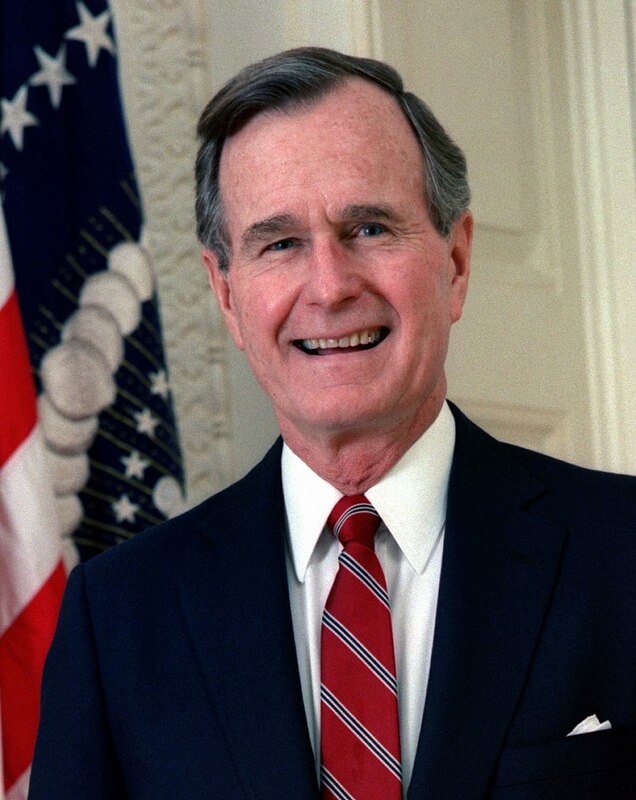 The passing of former President George H.W. Bush last Friday has set off both reflection and grief. Many mourn the end of an era. Others remember fondly the character and lovable foibles that define his career in public service. 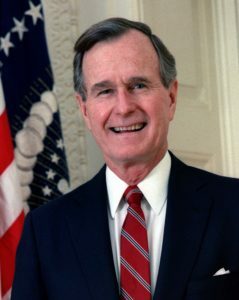 With his presidency sandwiched between two presidents known for their personality and public presence, Bush’s career nonetheless inspired many to serve. Both he and his wife Barbara left a mark on both contemporaries and eager young staffers, committed to the mission and touched by their warmth. “There’s so much [about how] he valued family,” Bruce Stebbins said of the remembrances. “He made each of us feel like we were part of a family,” the former Bush aide added. 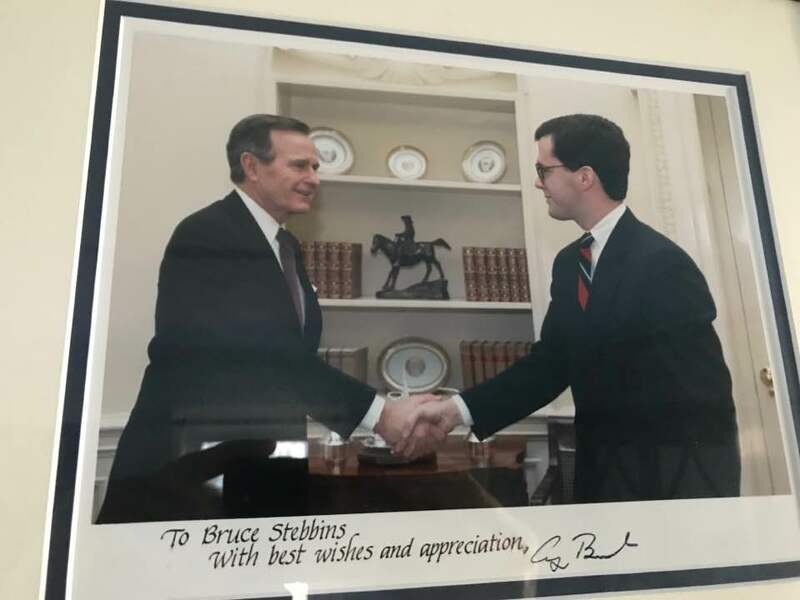 Stebbins, a former Springfield city councilor and now a Massachusetts Gaming Commissioner, has the photo Bush and him on his office wall. It was taken his last day in the White House, incidentally, the same day Desert Storm began. Stebbins has a copy of the president’s schedule which notes “Bruce Stebbins photo opportunity” wedged in between military and security briefings. On Thursday, Bush, who served as president from 1989 to 1993, was laid to rest in College Station, Texas alongside his wife Barbara, who died last April, and daughter Robin, who died of leukemia 65 years ago. History should not gloss over Bush’s policy failings or political tactics. But at a time when service seems so undervalued and politics so crass, recognizing Bush’s legacy of promoting a commitment to serve has value. Staffers remember Bush’s friendliness, sense of humor and graciousness in defeat. His fondness for handwriting notes was legendary. Stebbins, who now lives his family in Holliston, graduated from East Longmeadow High School and went to college in Washington. While interning in the Reagan White House, Stebbins got to know Andy Card, a former Massachusetts state rep then working at Intergovernmental Affairs. Card left the White House in 1987 to run then Vice-President Bush’s presidential campaign in New Hampshire. He invited Stebbins to join the campaign. There he assisted Card and Ron Kaufman, another GOP luminary from Massachusetts. Stebbins planned and staffed Barbara Bush’s schedule in the Granite State. He brought surrogates like Chuck Yeager and Ted Williams up from Logan Airport, too. Stebbins spent plenty of time with the candidate, too, attending events in backyards. Stebbins, a genial but reform-minded ex-politician, recalled the excitement of that time. “He had a great conversational, friendly tone,” Stebbins recalled. Afterward there were always long lists of thank-you notes to go through. It happened everywhere. Stebbins said Bush’s limo once broke down and the Vice-President struck up a conversation at a nearby house. They ended up talking about her son and Bush expressed an interest in sending her son a note about cufflinks or a tie bar. “He did it all the time,” Stebbins said of the note writing. After New Hampshire, Stebbins helped with the campaign in Massachusetts and became an alternate delegate to the GOP convention in New Orleans. He later returned to Washington and worked in the Department of Transportation before following Bush into the White House in the Police Affairs office. Stebbins is not the only East Longmeadow native to work for Bush. Bernie Sweeney worked on Bush’s 1980 campaign. His route to that role was a little different, though. Bush’s youngest child Dorothy “Doro” Bush was a roommate of a woman Sweeney’s roommate was dating. It was just after Jimmy Carter became president—ending Bush’s CIA career—but the now former top spy chief was looking to 1980. Dorothy Bush reached out to Sweeney and connected him to Bush, who was coming to Springfield to meet with MassMutual executives. Originally calling for directions, Sweeney eventually offered to pick up the Republican from Bradley Airport. At this point, Sweeney admits he had not put together who Bush was and went to Bradley with a sign reading “Busch.” As passengers from Bush’s flight disembarked, Sweeney recalled them chatting about whether they recognized another passenger. When Bush alighted from the plane, Sweeney, too, realized who he was. Sweeney quickly discarded the sign and greeted Bush directly. After Bush’s meetings, he had planned to take a bus east to his brother-in-law’s home near Boston. Sweeney offered to drive him and extended an offer to drive Bush during future forays into Western Massachusetts. Bush would take him up on his offer. Later as the 1980 campaign ramped up, Card and Kaufman reached out and the three helped form Bush’s campaign in Massachusetts. Though Ronald Reagan ultimately won the nomination, Bush won Massachusetts. Sweeney, too, remarked on Bush’s graciousness in defeat in that campaign and rallied his supporters back Reagan even before Reagan put Bush on the ticket. Both that and Bush’s willingness, indeed, need to work with Democrats in office left an imprint on Stebbins, too. As a Republican elected in Springfield, Stebbins was a political rarity. Overcoming differences was essential to accomplishing anything. It led to passage of the Americans with Disabilities Act and the bipartisan budget deal. The taxes in the latter, some say, ultimately sapped Bush’s reelection chances. Technically, there are no “sides” or “aisles” in Massachusetts local government. Yet, Stebbins took that attitude to heart over the years himself as an elected and appointed official. Follow up notes still have a power, too and Stebbins has tried to emulate his old boss in this way, if electronically and not as prolifically as Bush had. Stebbins would maintain some form of government service almost continuously since leaving the White House. Sweeney, too, spent a career working in the federal government. He worked in Washington, but had moved his family back to Connecticut by the time Bush took office. He retired a few years ago as the Connecticut Director for the Small Business Administration. Many of the remembrances of Bush discuss a passing era. However, there is a broader theme that, while transcending his generation, feels novel today. From navy airman to Congress to cabinet posts to vice-president, Bush, a son of privilege had unhesitatingly embraced public service as a noble calling. Both the former president and his wife imparted that onto their staff, whom they welcomed as family. In his 1992 concession speech, Bush implored young people not to give up on the electoral process. Many young people then did not give up on service. “I always considered myself lucky to have known them,” Sweeney said. Over the years, Stebbins kept in touch with members of the Bush family, especially as George W. Bush sought and won his own White House term. Stebbins later went to Washington to pay his respects to the elder Bush.